As every camper knows, space is very valuable whether you are staying in a camper or backpacking it in the backcountry. To help with this dilemma, I am always looking for new products that have many different uses and the LighterBro is no exception. This new product is the answer to many outdoor enthusiasts’ prayers. 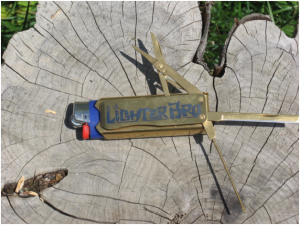 First, the LighterBro is a multi-tool that contains a space for a lighter, which means no more searching in the bottom of the backpack for that dang lighter. Next, in the side of this product is a set of multi-tools. This includes a Philips micro screwdriver, which is very hand especially if you wear glasses and need a quick eye glass repair. It also contains a small knife and scissors. Both of these are placed in the LighterBro so that they are easily accessible to the camper without much work. Saving the best for last, the LighterBro also has a bottle opener in the bottom of the tool. Having located in the bottom makes it easy to reach when you need to pop open that bottle of sparkling water to quench your thirst after a long hike. Lastly, what sets this apart from other multi-tools is the fact that it is so compact and allows you to keep your fire starting equipment along with other tools that may be needed to start a fire. At this point, you may be wondering how this tool keeps from getting lost in your backpack. Well, LighterBro has thought of that and has included a key ring so that the multi tool can be attached to your keys, to your backpack, or to the belt loop of your pants. While this multi tool is exceptional, there are a few things that I would change. First, I would offer a few different colors verses on the gold colored titanium. The gold does stand out but after thinking about the different season and environments that this tool could be used in, I realized that maybe gold is not the best choice especially if you drop it in the woods. The gold colored tool could easily be lost in a pile of leaves. A better approach would be to either make the writing on the tool brighter and/or offering the tool in earth tones along with bright options. This later could include bright blues, yellows, and a hunter’s red for emergencies. Lastly, I would suggest that a stronger key ring be attached to the multi tool. The product did come with a key ring but it did not appear to be as good a quality of material as the LighterBro body. In doing so, prior to taking this product out to the woods I plan on replacing the ring. Overall, I would recommend picking up a LighterBro before your next camp out. It will prevent you from spending time looking through your pack for that lighter to start the fire or that pair of scissors that you need to cut open that package of vegetables. In doing so, this simple tool will save you money and time, which equates out to more time that you can use to enjoy your trip.